Amongst all the excitement of the Dreamcast collection and possible Dreamcast re-releases, it seems that many gamers outside of the NiGHTS fan camp had forgotten about the humble SEGA Saturn. So lets celebrate the fact that Treasure saw fit to re-release one of the best SEGA Saturn titles of them all. Guardian Heroes feels right at home on Microsoft's own Xbox Live Arcade, but read CapnCloudchaser's review to see for yourself! Guardian Heroes is a side scrolling beat 'em up sprinkled with RPG elements, such as skill points and a story involving swords and magic. The game also features branching paths within the co-op-able single player in 'Choose your own adventure' style, as well as various multiplayer modes. Whilst the closest similar example to Guardian Heroes I can think of is Castle Crashers on Xbox Live Arcade and PSN, trust me when I say that Guardian Heroes is a much better game. More to see, more to do, and it was made by Treasure of Gunstar Heroes and Radiant Silvergun fame, for crying out loud. What more do you need to know? 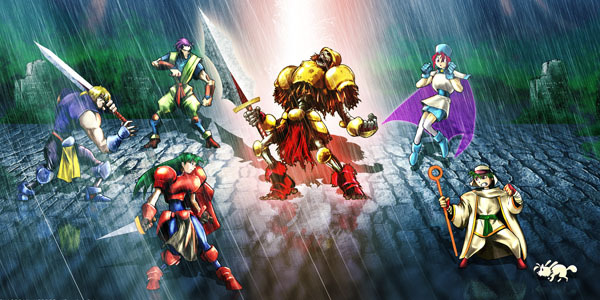 Originally released in 1996, Guardian Heroes was a real classic of its time. I have many fond memories of playing through the story mode co-operatively, and taking part in six-men multiplayer brawls with characters that can only slap each other silly. Now, a whole new generation can share my joy online with friends from around the world. Really, if you're a 360 owner and haven't already purchased Guardian Heroes by now, you shouldn't need this review here to convince you. Stop reading and download it right now. Downloading? Okay good, keep reading! For all those unfortunate souls who haven't had the chance to play the Saturn original and who don't want to splash out £30 or so on eBay for the privilege, the Xbox Live Arcade re-jiggery is definitely a complete and masterful experience. The original game modes and characters are all there, with a few new extras. The story mode allows you and a friend, if you choose, to battle through various stages as one of five playable characters, each with their own fighting style and unique abilities. Here, you can level up, explore different story paths and unlock new characters for the multiplayer modes. The original versus mode is included, but has been boosted from six players to twelve players. All the characters you unlock from the single player mode can be selected, with various stages and rule sets. Whilst many of these characters lack the depth of moves the main five hold, a full twelve player battle online can be just as chaotic as a game of Super Smash Brothers, and just as much fun. This version of Guardian Heroes also comes with a new training mode to test out various characters' move sets, and an arcade mode, which is basically a non-stop survival battle to the death and equally as chaotic. 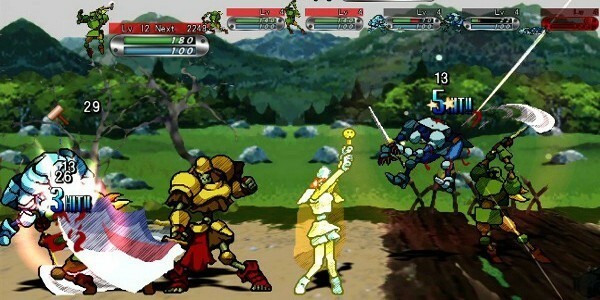 Guardian Heroes for Xbox Live Arcade is bundled with the Original mode in all its pixelated glory and a whole new Remix version. The default Remix setting adds a new splash of paint to the game’s aesthetics, touching it up here and there. It's only when you switch over to Original that you realise just how dated the Saturn graphics actually are, and despite many retro game re-releases looking rather blurry and rubbish in their new HD overcoat (I'm talking about you, SEGA Mega Drive Ultimate Collection), Guardian Heroes' new makeover is rather pleasing on the eyes, and generally preferable to the original graphics for most people. Unless you’re a die hard, of course. Remix also comes armed with various other additions to the control style, none of which detract from the original gameplay. In Remix mode, certain actions will cost MP, such as back stepping or countering, however MP will also regenerate over time. In Original mode, you need to bash enemies to recover your MP, but casting spells will earn you experience points. In Original, you can also be 'stunned' when overcasting magical abilities, whilst this is absent in Remix. The control mapping is also slightly different in Remix, with attacks split across three buttons, rather than the original two. This mixes up the combo system somewhat, but also allows for more flexibility. For example, Remix introduces various counter moves, such as escape throws, force pushes and air dashes that were either missing or forgettable in the original control layout. Personally, I prefer the Original mode for its controls and style, especially as one of my favourite dash attacks for Serena is missing from Remix for some reason. But thankfully, you can choose whichever gameplay style you prefer separately from the graphical options, so I’m happy playing with Original settings under shiny Remixed graphics. If you’re one of those gamers that love re-mastered versions of games, as long as they keep the original soundtrack, then old Guardian Heroes fans will be pleased to know that the original soundtrack remains intact. The story is more or less the same as well, although certain aspects of it seems to have been rewritten, possibly for clarity or just to appeal to modern gamers. The usual Xbox Live junk is all there too, such as leaderboards and achievements, but it is really the multiplayer aspects of Guardian Heroes that shines through. Both the story and versus modes can be played via online or offline multiplayer. The story mode itself will keep you busy for a while whilst exploring each of the individual story paths, and the variety of options in versus really is impressive. For only 800 Microsoft Points, Guardian Heroes is one of the most generous re-releases of any video game, SEGA or not. Its been around sixteen years, and yet Guardian Heroes remains a fantastic game to this day. It's casual enough for non-beat 'em up fans to get into, whilst offering higher difficulty modes and challenges for fans of the genre. I'm just hoping that Guardian Heroes will eventually pave the way for a true sequel, and inspire SEGA to re-release some of their Saturn back catalogue. But only you, and your wallet, can help with that! Excellent review, well written and entertaining! Valgar Reinheart ftw!